Home › Toys › Best Choice Products Musical Learning Pretend Play Tool Workbench Toy Fun Sou..
Best Choice Products Musical Learning Pretend Play Tool Workbench Toy Fun Sou..
Best Choice Products is proud to present this brand new Musical LearningWorkbench. This colorful set includes 6 tools: a hammer, wrench, screwdriver,saw, drill press, & clamp which can be used for your child's imaginaryprojects. It also includes 4 different shapes that can be placed through theworkbench, as the object passes through, a voice on the toy will identify theshape of the object. A small storage drawer is located at the front, which canbe used to store toys. Above the drawer there is an adjustable bench clampwith numbers 1-5. When the clamp is moved to a number, it will say the number& play a song according to the number. 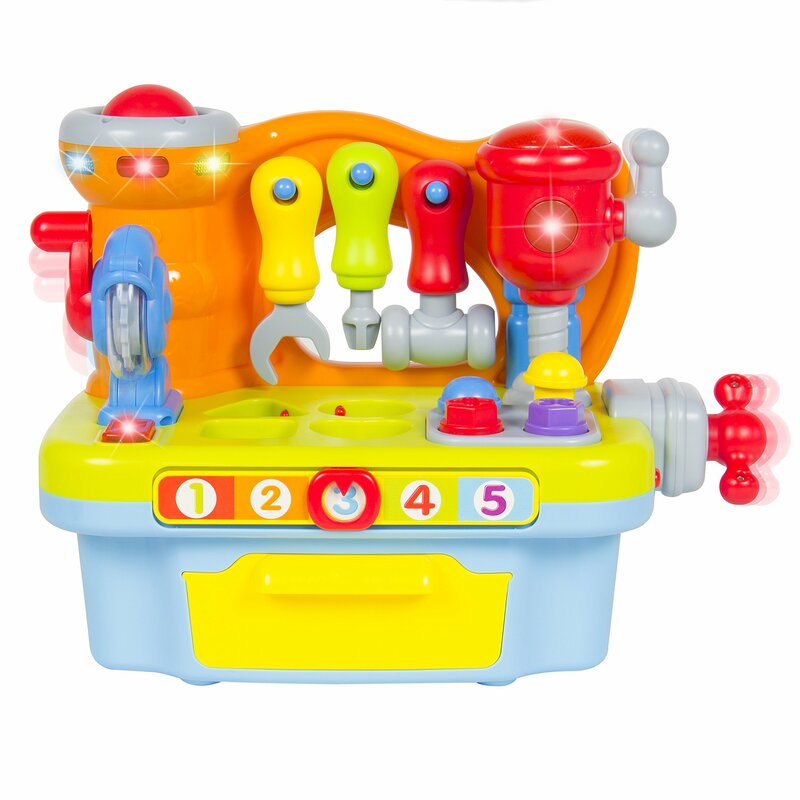 The toy also comes with an electricdrill & saw that both light up & mimic the sound of an actual drill & saw.Parents can control the volume by adjusting the volume to mute, low or high.Buy this awesome workbench for your child's critical stage of development. 2AA batteries are required (not included) & has a recommended age of 18+months. SPECIFICATIONS: No assembly required;2 AA batteries are required & arenot included;Recommended age: 18+ months;ProductDimensions:6"(L)x11"(W)x8.5"(H);Weight:1.4 lbs.;Material:Plastic;Color:Multi-color. The Very Hungry Caterpillar Eric Carle - Baby Soother And Musical Night Light..
Kiddey 3Pc. Kids Play Tent Cubby-Tunnel-Teepee Pop-Up Children Play Tent All ..
Naicewater Balloons 6 Different Colors Fill In 60 Seconds 222 Total Water Bal..
Dab-O-Ink 6 Pack Bingo Daubers - Mixed Colors - 4 Oz. Vaporeon Pok Plush (Standard Size) - 8 1/2"
Traxxas 2478A Anaconda Tires Pre-Glued On Tracer 2.2" Black-Chrome Wheels (Re..